Lookie, lookie!!! This is our precious baby...Arabella! Our first picture of her...awwwww! 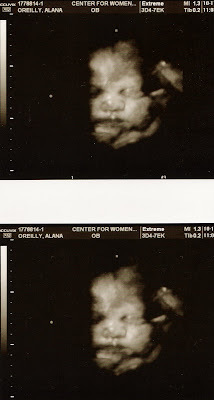 We went last week for an ultrasound and did not expect to leave having seen our little girl! The tech was telling us that they had gotten a new ultrasound machine a couple months ago that has 3D capability. WOW! We were pretty excited, to say the least. I'll admit though, before this ultrasound, I would have said that I was pretty sure I would want to wait to see what she looks like until birth. How wrong I was!!! This was the coolest thing ever! It made my day, week, month! She is absolutely sweet, adorable, cute...and ours! Both Jeff and I were completely excited to see what she looks like. She has chubby little chipmunk cheeks from these pics! We are SO excited to have her arrive!!! Only a couple more weeks left! I'm especially looking forward to her arrival from a purely selfish reason...I've been showing beginning signs of preeclampsia. What a bummer! My doctor has prescribed rest for me...not exactly my favorite way to spend a day! She really wants me to keep my feet up as much as possible. This will help with the swelling in my feet...and it really has helped. I'm just not patient with sitting for a long period of time! I haven't been as diligent about it the last couple days and I've noticed a little increase in the swelling. In addition to this, I've been having contractions the past few days or so. We've had a couple days where they were pretty intense, to the point where we were hoping labor had really started! Not the case though :( Hopefully soon, I can't wait to see my baby!